Before the usual applications in use is the Windows insider, with a choice of options in the form of Ring: Fast an Slow. Simultaneously with the announcement of Microsoft, about some of the windows phone device (Win phone 8.1) that can be upgraded into a Win phone 10. .... In other applications that can make use to upgrade Windows phone. 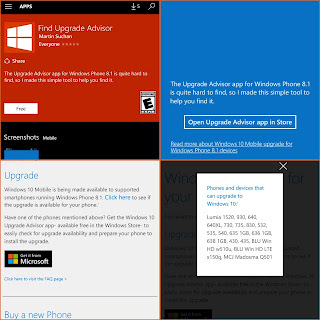 Name the application " Advisor upgrade ", which is only in use by Windows phone devices with OS WP 8. 1. .... as an application developer WP 8.1 Windows phone. This application, you can get on Windows phone store. You are on the website page WINDOWS MOBILE PHONE - setting and Upgrade. Application supporting upgrade Win phone 10 With the link URL http://hand-uk.blogspot.com/2016/03/application-supporting-upgrade-win.html for this articles, you can bookmark or share to any. Our expectation that Windows smart phone users, can understand and know about OS Windows phone. Application supporting upgrade Win phone 10 Is a link for you, How to use the pure smart phone.